Since version 4.0 LinqConnect can be used for writing Windows Metro applications. 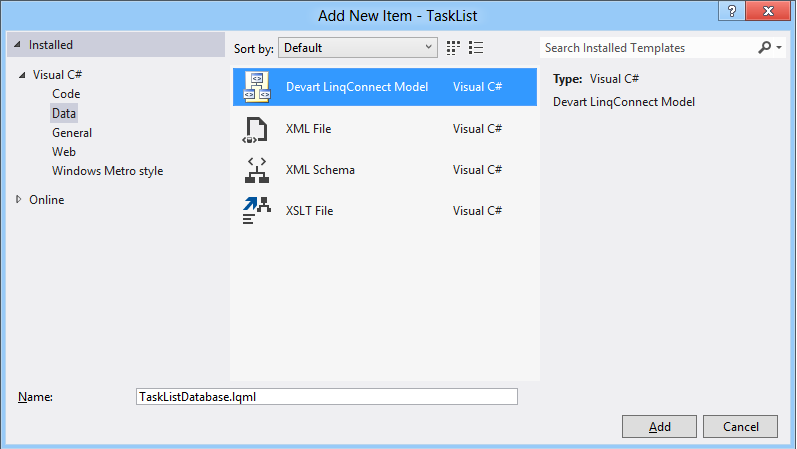 In this article we will show how to use LinqConnect for working with data, bind data to user interface elements, group data, etc. We will also discuss some other aspects, that are necessary to know for quick integration of LinqConnect into your applications. You can download the sources of the sample application using the link at the end of this article. 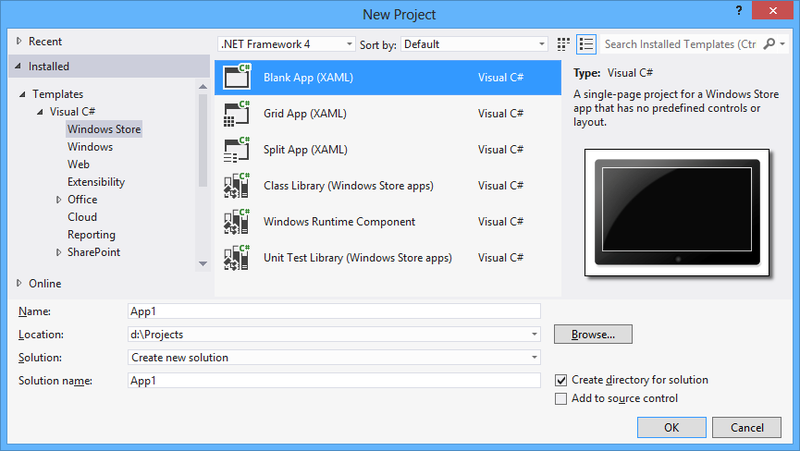 Let’s start with the creating project in Visual Studio. On the File menu, point to New, and then click Project…. 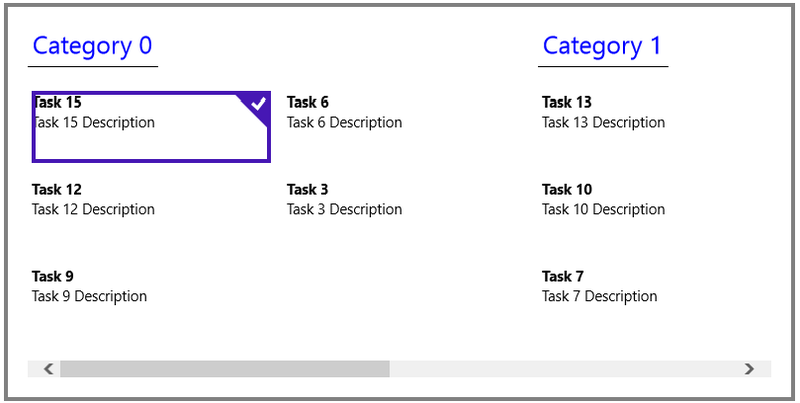 In the New Project dialog box, select Visual C# > Windows Store, then select Blank App (XAML) in the list to the left, and click OK.
After this we need to add references to the LinqConnect assemblies. For this, right-click the project in Solution Explorer and select Add Reference… in the shortcut menu. In the displayed dialog box, select Windows > Extensions. 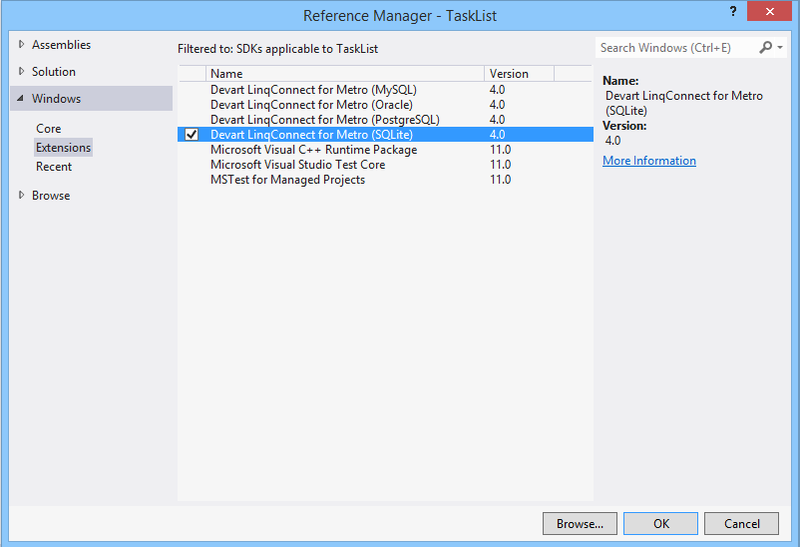 In the list on the right select the Devart LinqConnect for Metro check box and click OK.
After this, the Devart LinqConnect for Metro node will appear in the References node. If you compile the application now, four LinqConnect assemblies will be placed to the binDebug folder: Devart.Data.dll, Devart.Data.SQLite.dll, Devart.Data.Linq.dll, Devart.Data.SQLite.Linq.dll. These four assemblies are the Extension SDK, named Devart LinqConnect for Metro. Now let’s create a model using the Model First approach. Right-click the project in the Solution Explorer and select New Item from the Add submenu of the shortcut menu. In the displayed Add New Item dialog box, select Devart LinqConnect Model as shown on the following illustration. After clicking Add, the Entity Developer Create Model Wizard will be displayed. It helps to create and tweak a new empty model. Choose Model First on the first wizard page, and choose SQLite as the Target Server on the Model Synchronization Settings page. On the Model properties page you can specify the name of the namespace and the DataContext class of your model. 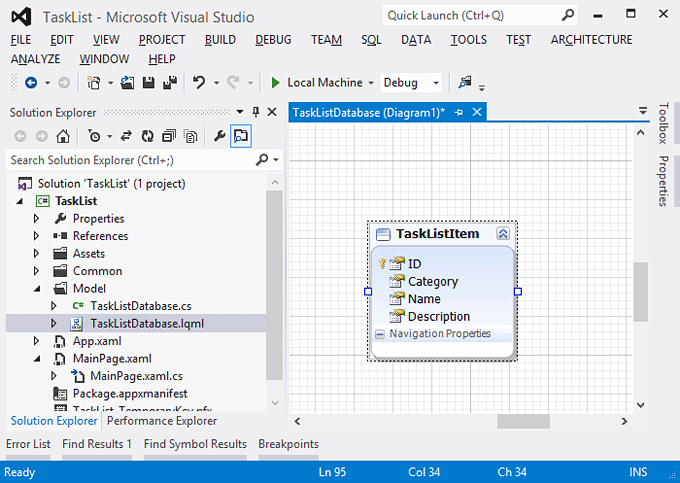 We have used TaskListDatabase as the DataContext class name. 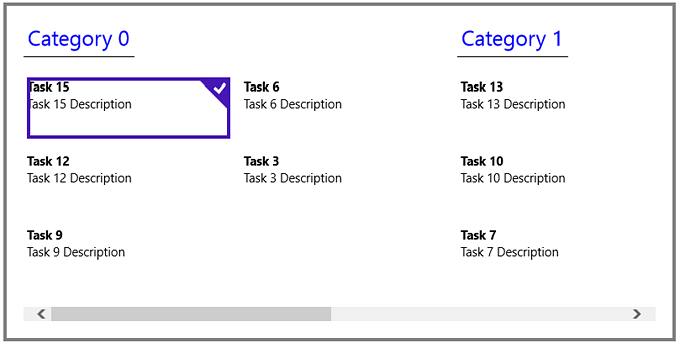 After saving the model, the C# code for the TaskListDatabase context and the TaskListItem entity will be generated automatically. Additionally we have manually created the TaskListDatabase.cs file (on the screenshot above). This file will contain the DataContext methods for creating database. // .. process exception, show error message, etc. You could notice that we used the methods with the Async suffix in the first DeployDatabase example. Since asynchronous execution is a key part in Metro application development, we have added this feature to LinqConnect for Metro. The DataContext class has the CreateDatabaseAsync, DeleteDatabaseAsync, and SubmitChangesAsync methods. All of them can be used with the await and async keywords, introduced in С# 5.0. We have also extended the Queryable class with the new extension methods, for example, ToListAsync, CountAsync, SumAsync, etc. ms-appx:///path_to_database – determines the path to the file in the folder, where the application is installed. full_path_to_database – full path to the database file. It is used as-is. In the following examples we will show how to create two different connection strings, actually specifying the same database file. We will use GridView for displaying data. Let’s write the code for reading all TaskListItems from the database and assigning the results to the GridView.ItemsSource property. Then we declare GridView in XAML. Data binding is performed in the two TextBlocks in the DataTemplate. 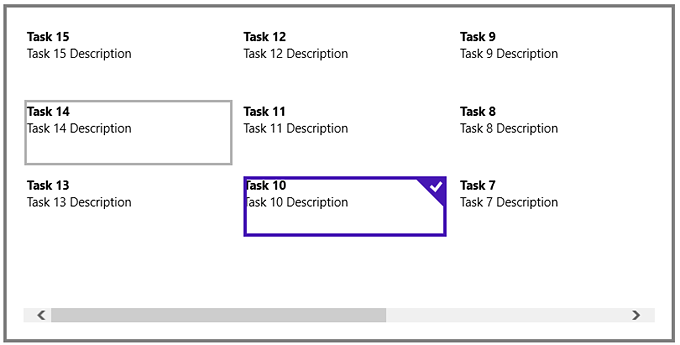 These TextBlocks are bound to the Name and Description properties of the TaskListItem class. The result is shown below. ItemTemplate is not changed, however we use CollectionViewSource as an ItemsSource. It can be declared in the page resources in the following way. We should also note that we assign the collection not to the GridView.ItemsSource property, but to the CollectionViewSource.Source property. The result of displaying the grouped data is shown below. You can download TaskList solution here.